For 25 years I have tended different Special Purpose species to see which will eventually replace Radiata Pine as the useful mass-production survivor tree that grows fast and easily, straight and true. The new trees will produce wood that is insect resistant, strong, stable, and doesn't need poisoning to be used in our houses. There are two or three best candidates, and now after a full cycle of propagating, planting, releasing, pruning, felling, and now chainsaw milling, there are three trees that draw for the gold medal: Sugi or Japanese Cedar (see the Japanese Cedar blog), Leyland Cypress (more to come), and the one all the farmers and back country foresters have heard of: Lusitanica, or Mexican Cypress. Best planted at 30-40+ cm, they look similar to Macrocarpas, and grow faster: caterpillars can nip out a tip, and unlike young Macrocarpas, Lusis keep growing with a strong new dominant tip. They are also hardy: When your minus twelve frost browns off the Macrocarpas forever, the Lusis will hang in there with the larch and fir. So they are useful planted inland. 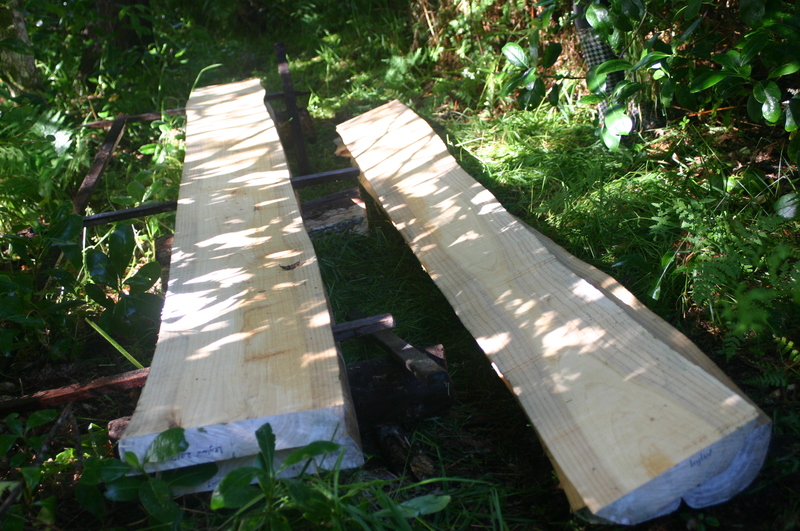 Great timber in 25 years, more than 300mm diameter. More than a foot thick. Thinning and milling, me and my forester mate Danny can see that Lusis are all set to take over the world. Well, the NZ pine forests anyway. They are more of a pain to prune though, more branches and harder wood, so sore arms for the boys. Unless these promised robot flying pruner drones actually materialise. Pruning costs will have to rise. But look at the clearwood! Drool over the golden grain! It is already the second generation for Cupressus lusitanica – and some of its even better hybrids with Macrocarpa. It has proven itself beyond expectations. Lusitanica fills the gap where our treasured Macrocarpa cannot grow well. They are basically easy-to-grow Macros. Anyone considering planting Pines now would be mad not to plant a good percentage of their forest into Lusitanicas instead. It's going to be worth three times as much to New Zealand especially if we also process the wood onshore. Flitches milled from young 20 year old lusitanicas on the West Coast. Talk to the Treeman at Dial-a-Tree about planning your forestry block. Ask about larger quantities of this breakthrough timber species and other alternative timber trees. We provide organic tough young trees. We use our forestry experience in the gorse and rain, to provide the trees we know which tend to survive. See our website and listings on Trade Me. Cupressus lusitanica hybrids, W. Coast provenance, 30cm+ $140 per 40 trees in rootrainers. Minimum order 40, freight: $18 per box of 40 trees nationwide and RD. We freight everywhere, please state if Rural Delivery to get the same rate. Free delivery Hokitika, $10 Greymouth Offshore islands extra.